Switzerland is not a poor country. That’s why we have built a new tunnel through the alps for 6.4 billion. That’s only a fraction of the entire project costs of nearly 18 billion and we have decided since to build an additional road tunnel as well. The 6.4 billion tunnel is railway only. The idea behind it was to load trucks on the railway in order to not have them sneaking through the alps. The tunnel opened at the end of 2016. 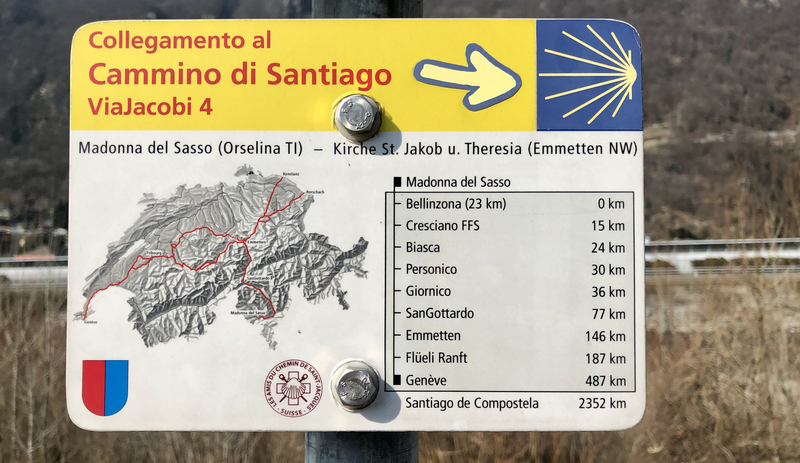 It is a nice surprise: You can now reach Biasca in the southern part of Switzerland in just 2 hours. Fantastic. As my trails are still buried under between 2 and 3 m (some 9 ft) of snow, I search for a somehow snow free alternative or parts of my trails that are. I find one section in the Ticino. 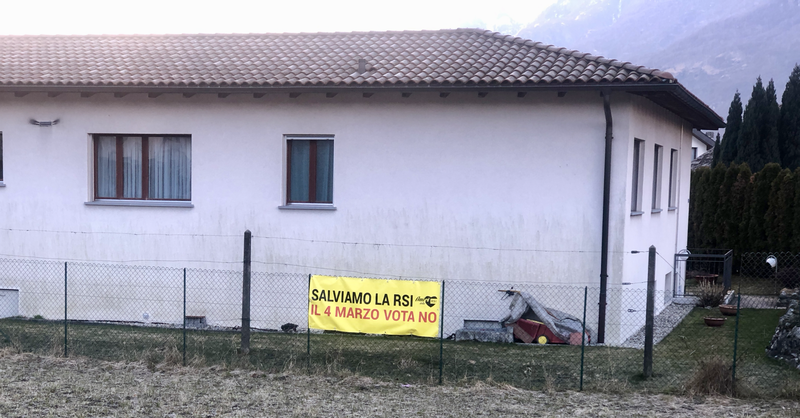 From Biasca to Lugano. Of course, there is again some marketing speech on the website of Switzerland mobility. This time they write about magnificent rambles through riverside forests. By now I can imagine what it’s all about. 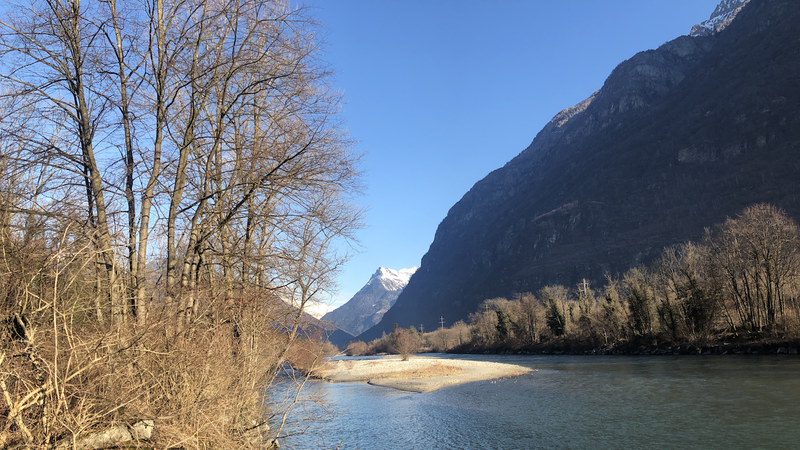 I know the Ticino better than the local tourism office wants me to do. My mother grew up there and when my grand-parents were still alive we spent a lot of holidays down there. Don’t get me wrong, it is extremely nice, if you get the right spot. I can even imagine having a house there. So far, I didn’t find something, maybe I just searched on the wrong webpage? 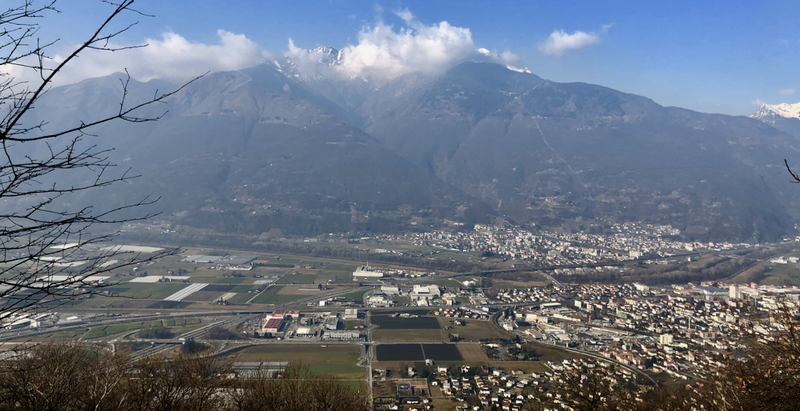 With a workforce of more than 1000 members our publicly owned TV&Radio is the biggest employer in the Ticino after the administration of the canton. They provide 3 different radio and 2 TV stations plus a website. 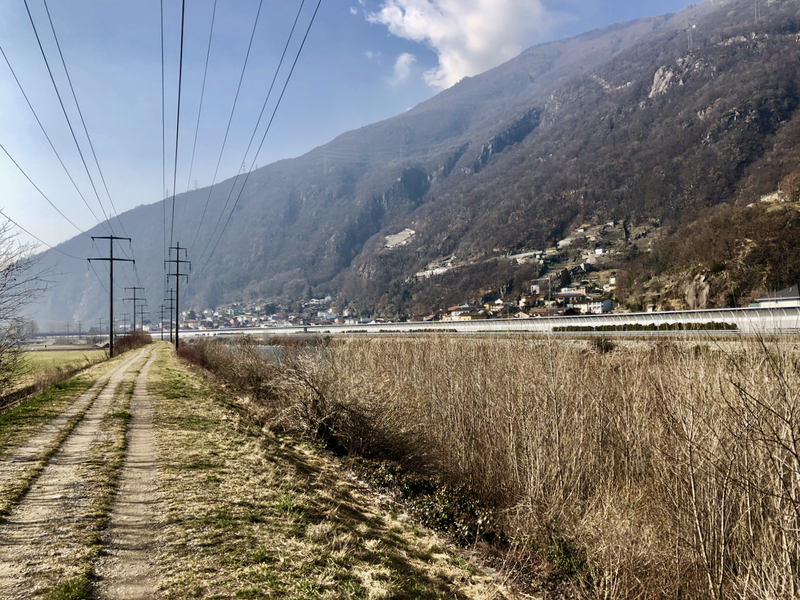 Giving the Ticino the biggest media density in Europe. Somebody wants to get rid of it all so there will be a nationwide votation. From Biasca railway station you need to go to the river. And then you want to make sure, you have a device that’s able to push sound towards your ears because you will be walking along the river but the highway will never be far. It is the main connection between Nord and South, if you are a truck spotter you will not be disappointed. The first 17 miles or 23 km are all along the same river. And it’s at least in February nothing for people who want to see nice landscapes. It is more a ride through trashy industrial areas. Most of the time you are walking on the barrages. 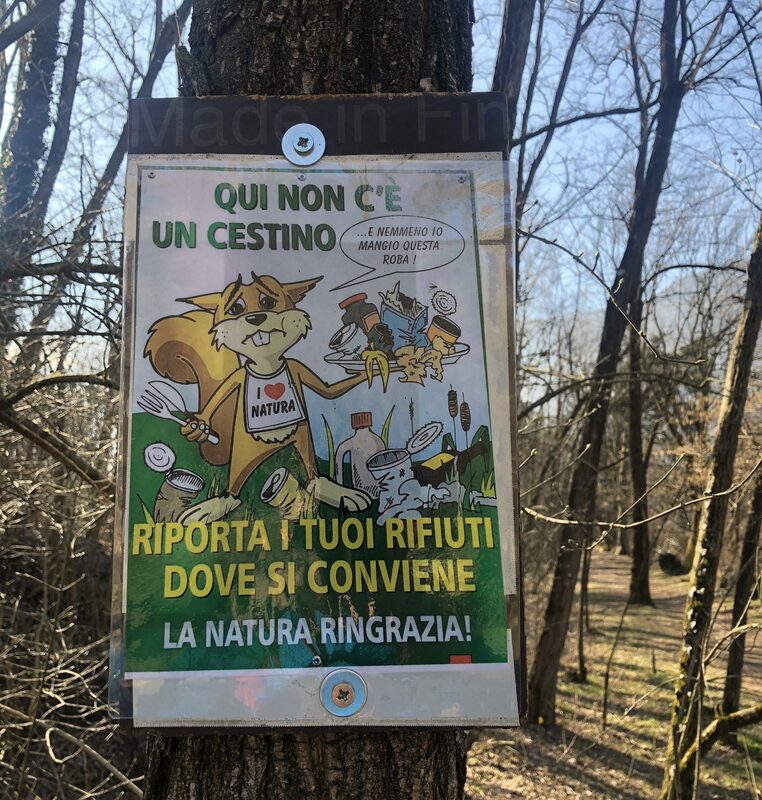 On one side you have something like forest and on the other side a lot of construction companies or even a quarry whose workers are busy blowing up the mountain. One time there is no way marker which leaves me walking along an airfield. Our public defense company RUAG is also there, these are the guys who sell ammunition in the US. Small arms ammunition – I don’t think that this is something Switzerland should do with public money. As a cynical joke we often say that even if you get shot you can certainly feel the difference between Swiss quality and an inferior cheaper product…. Our air force exercises on this airfield but with small propeller aircraft only. Acoustic pollution, there was a votation once about air force exercises over touristy spots. Unfortunately, it was not successful. There are the usual bunkers, this time one is still equipped with a cannon. From the second world war (and useless because it was obsolete before the concrete was dry). The entire river banks are not extremely proper given we are in Switzerland. A lot of used TP. It is understandable given the length of the section and how far away the towns are. It is extremely humid here so your number two will not last long. Your TP does, and nobody digs a hole here. A lot of joggers are out most of them have a bad running style and their shoes belong in the trash. Even folks with a lot of natural padding run on concrete, with their old shoes. Some of them I would really like to stop. Health insurance works along a solidarity model here. We, the healthy ones, have to pay for those who destroy their joints by running like this. Once the sun is out it gets even warm. I hike with my contacts and have to use shades. If you know me, you probably know that of lot of research went into my choice. I switch the lenses to something with the name fire iridium. The contrasts are fantastic. I prefer these cooler temperatures instead of the heat here in the summer. From the train I was thinking that there will be no problems with snow. It seemed that the snow was high up on the mountains. The air is extremely fogy and dusty. Strange environment to hike but what do you do. I can hardly spot the castles in Bellinzona. The mountains appear just as a wall. 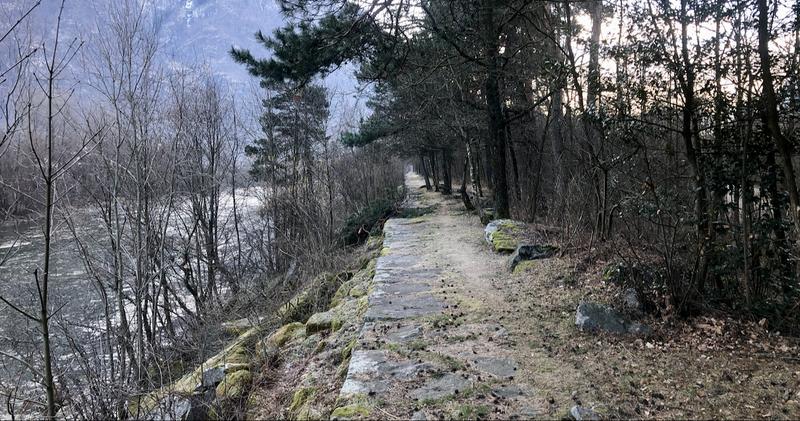 It’s a higher wall but I am so happy to leave the industrial zone and to start climbing as I have to cross two mountain ranges to Lugano. There was again a warning from the step climb into the next valley. It is not a step climb. There are lovely switchbacks the path itself is lovely. 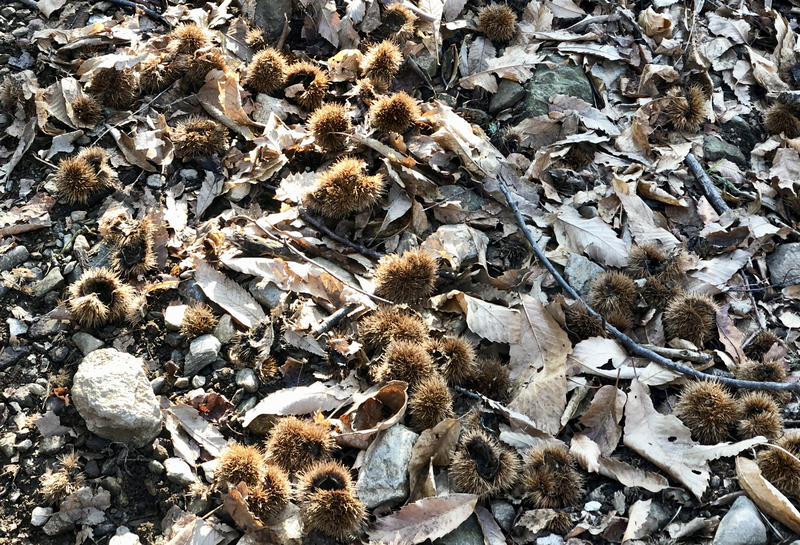 There are just chestnut burrs on the ground. You don’t want to fall down here. I wear extremely thin Hokas and wonder whether the burrs will manage to come through the upper or if they even puncture the sole. No burr bothers me, but I reach the snow. Nothing bad can happen, my micro spikes lurk in my pack. The snow is like frozen but extremely gripy. I have no problems with the snow. With shooting I have. There is an army training ground just before the descent to Isone. Here the bravest of the brave Swiss army soldiers get their formation. Rumors say that even AAD 10, something like team six of the Swiss army, gets its formation in this place. This is the army unit who planed an evacuation of Swiss citizens from a Libyan jail when Mr Colonel Gaddafi was still in charge. You have to set ambitious targets, right? No warning could be seen on the path leading up to this training ground, but they are clearly shooting automatic weapons. If you hear this sound in Switzerland, you know it has to be the Army. Otherwise you can be sure to see police forces soon. Those who appear on the scene with helicopters and machine guns. Soon I even spot the soldiers. Four nice looking young man run around on the path I was on just minutes ago. Their exercise must be like a sporty run. They carry the whole kit, including sleeping bags. In a real battle you would throw this kind of stuff away fast. You would not even survive for a long time like they move. I am really happy to see them train like this. It has nothing to do with real world fighting. As long as the best forces of your army train like this you can be certain that they are years away from a war. They speak French. I am still on the official trail. By now I can spot a shooting flag, something common in Switzerland but I have no idea if I move right into the bullets or not. I walk in the middle of a road, so I am clearly visible. The shooting appears to be nearer now but what do you do. Soon I spot a way marker that leads into the forest and down of the mountain. Of course, there is a warning sign but it’s only visible from the opposite direction. I am happy to leave Isone behind me. The army in Switzerland is often described as “the green holidays”. Men have to report from time to time for a refresher that will take 3 weeks after basic formation. Go figure what they do during off duty time. It’s a myth that every man in Switzerland has to serve. Maybe by law. Less than 40 % of an annual class serve their days. Theoretically I would have a nice view by now, but it is all fogy and dusty. I can see the Monte Baro however and the Denti della Vecchia or the teeth of the old lady. Some twenty-eight years ago I was really disappointed over there when my godfather deemed it too dangerous for me to climb on top of it, something I have still to do. I was many times on the Monte Baro. I really consider going up there. I carry everything needed except an ice-axe. I have seen a lot of self-arresting videos by now, but I decide to do such things when I had some real-life training and an axe with me. No doubt however, that I could run up there easily. I am on 1000 meters or 3280 ft, Mount Bar is 800 meters higher. Mount Bar is on the left side. The traffic signs are riddled with bullet holes, all the same size, but since it is forbidden, it could not have been the army. I love the air in the towns. It is this odor you get when people heat their houses with charcoal or with hardwoods. This towns are like a giant house with only small passages in it. The air gets trapped. I always associate this odor with some of my earliest childhood memories. The path now is extremely rocky and steep. I know I can follow it down like blind. I just put my feet somewhere and balance as necessary. The grip helps but also the way my shoes are constructed. They spread out towards the sole. If you are able to roll your ankle with these shoes you should switch to play chess or computer games. I know the way in Tesserete because my ex-Girlfriend and I passed here often. Just way slower. There is no one in the forest. I turn my headlamp in the brush, but I can spot nothing. Earlier I saw a fox and really fresh tracks, but they were accompanied by human tracks. 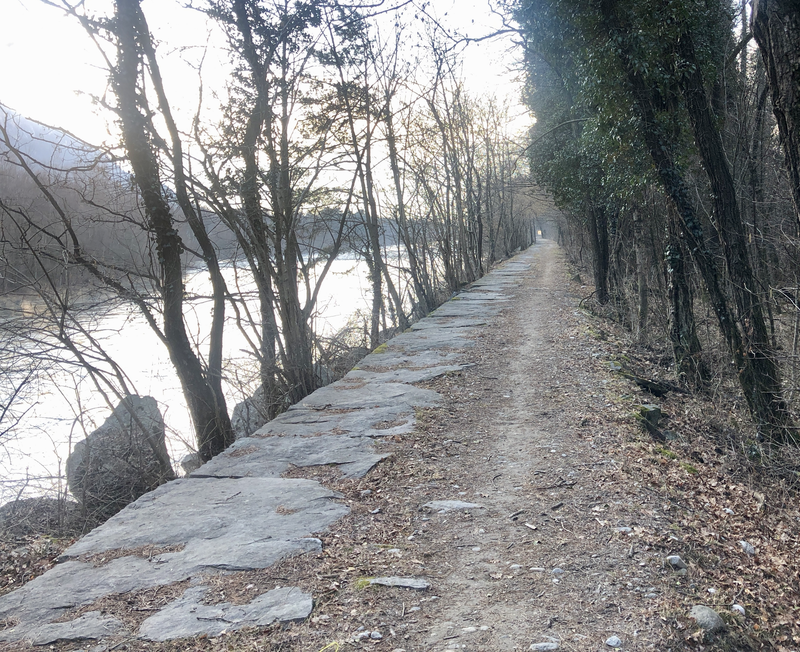 I remember that we had problems to find our way in Lugano. It is not easy since the way in my app isn’t marked. Sometimes there are signs on the ground, but they don’t look like official. For navigating in the city my app isn’t great. There is no way to navigate in the dark without a map and I have to turn often. Eventually I find the railway station. At the end of the day I have done just 35 miles. Give me four hours more and I will do 50. My shoe situation remains problematic. I bought Hokas again but you have zero ground feedback and I don’t want to know how much energy you burry in their cushioning. Their sole is a joke and so far every pair of Hokas I had died after 400 miles because it wasn’t sturdy enough.